Ferrobee.com - Bee mortality can be prevented by administering Ferro-Bee® to bee colonies. Since its introduction in 2013, more than 200 beekeepers now have experience with Ferro-Bee®. They keep bees under very diverse circumstances and in more than 12 different countries. We have used these practical experiences to supplement our instructions for using Ferro-Bee® and to specify the required dosages more accurately. Ferro-Bee® is a safe product for bees and bee colonies when it is administered according to the instructions. Under no circumstances do we recommend using Ferro-Bee® in combination with substances intended for Varroa control. Ferro-Bee® has multiple effects. 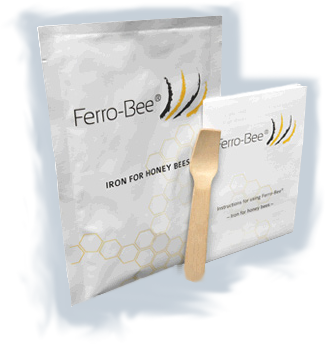 Mix Ferro-Bee® with sugar syrup and leave to stand for a few hours. Administer Ferro-Bee® to the bees using an internal or external feeder. Do this regularly, 1x per week, 1x per 2 weeks, or depending on the weather conditions (humid weather, rain) and depending on your own observations (shotgun brood, more lethargic bees, dead bees in or near the hive). You can also administer Ferro-Bee® once via the winterfeed. Short term: First 2 to 3 days: bees are more active, enhanced effect of the sugar added. Medium term: During the first 6 weeks: perfect brood development, fewer dead bees, and fewer bees ‘disappearing’. Long term: Lower winter mortality, bees in better condition after the winter.